If you’re thinking of purchasing a Power Rack for your home or workout facility, you need to be armed with all of the information to make sure you make smart decision and investment. Below you’ll find the answers to some common questions we hear from customers when selecting a Power Rack. Let’s start with the simple question: what is a Power Rack? Power Racks (also known as a squat rack, squat cage or power cage) are a piece of training equipment that functions as a mechanical spotter for free weight, barbell-based exercises without movement restrictions. Power Racks are perhaps the most versatile pieces of equipment you can add to your home gym, garage gym or fitness facility and are designed to accommodate free weight barbell exercises including bench presses, squats, overhead presses, rack pulls, rows, shrugs and many more. Power Racks also offer comfort and peace of mind with safeties and are a great tool for people who lift alone or at home. Are There Different Types of Power Racks? There are many different types of power racks including squat stands, half racks and full cage/full power racks. 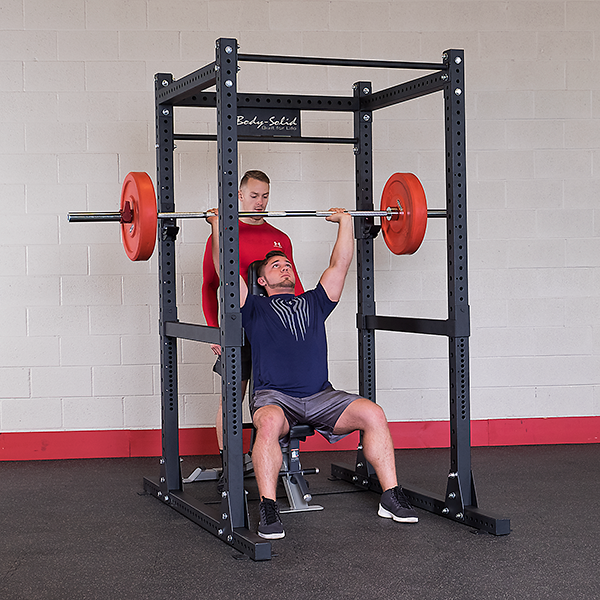 Squat Stands will feature two uprights and safeties while half racks and power racks will feature additional uprights and features including pull-up bars, weight storage and space for additional accessories and attachments. What Are Important Features To Look For? First and foremost, you’re going to want to find out a Power Rack’s weight capacity. If you are an experienced lifter, a lower priced/lower weight capacity power rack may not be a good pick. On the other hand, if you’re just getting into fitness you can find more economically-priced power racks with lower weight capacities. If you’ve just started lifting, you probably don’t need that 1,000 lb. weight capacity Power Rack just yet. When you’re looking for a Power Rack you’re likely to encounter a lot of discussions and talk about steel gauge. If you’re like most, you may not have a single clue what that means. Again, don’t fret. You aren’t alone. Gauges are used to specify the thickness of sheet metal and since Power Racks are made out of the metal, you’ll see this spec show up often when Power Rack shopping. Power Racks vary in steel gauges with some offering 2″x 2″ 11-gauge, 2″x2″ 14-gauge and 2″x3″ 11-gauge and 3″x3″ 11-gauge. Much like weight capacity, you’ll want to shop smart. If you’re a beginner, you may not need the highest gauge so make a note before you make your final Power Rack purchase decision. This seems simple but make sure the Power Rack you’re looking at can fit into your workout space/facility. Most manufacturers will list the length, width and height of the Power Rack which will give you an idea of the space you’ll need. Keep in mind while many exercises are performed inside the Power Rack, you will want an additional radius around the Power Rack to give room for your Olympic bars and also allow you to do workouts that utilize both the front and the back of the Power Rack. To be safe, give yourself an extra few feet on the dimensions to ensure you have the room to workout properly. If you just want to do basic workouts like squats, deadlifts and overhead presses, this may not pertain to you but if you want to make your new Power Rack the center of your workout facility, you need to know what you can add to it. Some Power Racks, like the Powerline PPR1000, have a few small options and attachments like a t–bar row or a u-link. Other Power Racks (like the SPR1000) feature dozens of different accessories and are designed to be the cornerstone of your workout room. You will also want to be mindful of weight storage on your Power Rack. If you want to keep your workout space looking clean, you may want to find a Power Rack that comes with weight horns or offers a weight horn attachment. Last but certainly not least, you want a Power Rack with a warranty that gives you peace of mind. There is nothing worse than investing heavily in a piece of fitness equipment only for it to break or malfunction. If one of these issues does arise, you want to make sure you have a Power Rack backed by a solid warranty to ensure your investment is protected. If you need additional helping finding the perfect Power Rack, visit Body-Solid’s Power Rack comparison chart. The chart will allow you to sort and compare features across Body-Solid’s entire line of squat racks, half racks and Power Racks. If you have additional questions, please reach out to us at sales@bodysolid.com or call us at (800) 833-1227.